“There comes a time when silence becomes betrayal,” proclaimed Rev. Dr. Martin Luther King Jr. as he took a risk and spoke out forcefully against the War in Vietnam. As more Americans debate whether to leave the sidelines and join the Occupy Wall Street movement, we should heed Dr. King’s words. Our individual silence is a form of acquiescence, and we speak volumes not only through our action but also through our lack of it. Silence signals that we are okay with what’s happening, or that we have simply given up. While Occupy Wall Street has inspired a new level of consciousness in America, we have only just scratched the surface of what will be needed to shift the political economy of our country. For activists new to the struggle as well as those who have been hitting the streets since the financial crisis began, this may mean taking on new risks. As he spoke from the pulpit of Riverside Church in 1967, Dr. King said, “The truth of these words is beyond doubt, but the mission to which they call us is a most difficult one.” Breaking silence entails risk because it means facing one’s fear of ridicule, embarrassment, failure and more. It is easier and safer to remain silent. But as we’ve seen over the last few years, our collective silence has come with its own set of costs in the form of lost jobs, homes and pensions. Last Tuesday, members of Southsiders Organized for Unity and Liberation (SOUL), an affiliate of National People’s Action, the community organizing network that I direct, took their risk-taking to the next level, with personal courage born of outrage. Sixteen members of SOUL, supported by 150 witnesses, were arrested at the annual convention of the Mortgage Bankers of America as they called on the big banks to reduce principal on millions of underwater home loans and pay their fair share of taxes. The action was part of a series of events organized by Take Back Chicago. 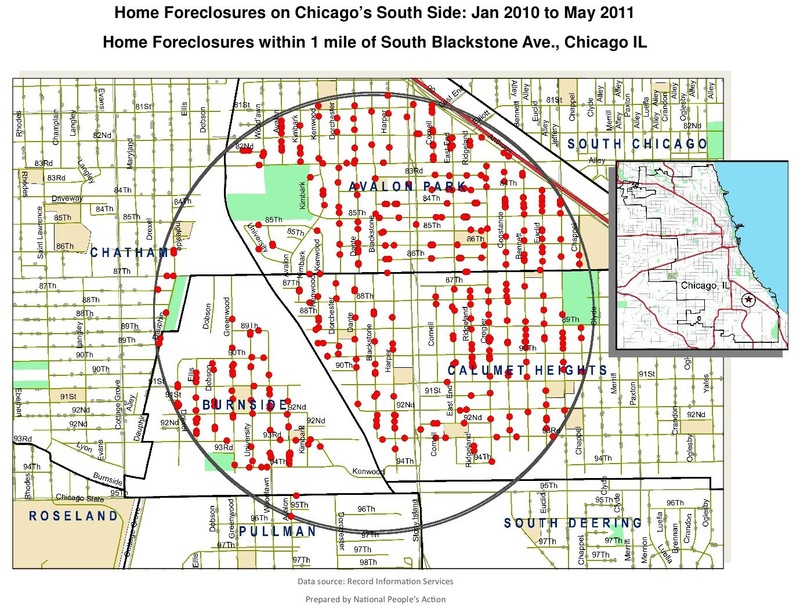 To get a sense of what the foreclosure crisis looks like in Ms. Smith’s Calument Heights neighborhood, see the map below. Within a mile of her home, over 500 foreclosures have been filed over the last eighteen months. Neighborhoods to the southwest of hers, such as Ashburn, have been hit even harder, with over 1000 foreclosures filed during the same period. As divinity student Neil Ellingson was carted off by police, he asked, “What would Jesus do?” Meanwhile the crowd chanted, “You are arresting the wrong people.” The chant raises an important point further brought to light by acts of civil disobedience. Over the last month alone over 100 people have been arrested while protesting foreclosures, while no one from Wells Fargo, Bank of America, Goldman Sachs or JPMorgan Chase has been fully held to account for their role in the foreclosure crisis. SOUL’s action Tuesday underscores the fact that the foreclosure crisis is reaching catastrophic levels in communities nationwide. The impact on communities of color is especially alarming, with often two to three times the number of vacant bank-owned properties as white neighborhoods. Three years ago arrests at protests to stop foreclosures were incredibly rare, but homeowners have been arrested by the dozens in efforts organized by Right to the City in Boston, ACCE in Los Angeles and others over the last few weeks. Together with Occupy Wall Street and the tar sands protests at the White House, this represents an emerging movement toward rediscovering the principles of nonviolent civil disobedience that were so central to Dr. King’s work. Thanks to so many people, like Ms. Smith, who have taken to the streets over the last few weeks, many more are joining the fight to create a more just and sustainable economy. But, getting there won’t be easy, and it won’t be comfortable. With yesterday’s dedication of the Dr. Martin Luther King, Jr. National Memorial, we should consider how and when each of us will break our silence, and turn up the volume. George GoehlGeorge Goehl is the director of People’s Action.